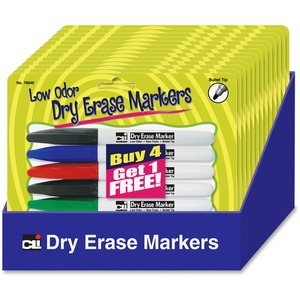 Display showcases Charles Leonard Dry-erase Markers in bright vivid colors, including green, red, blue and black. Use on dry-erase boards or glass. Marks wipe away clean. Pocket style lets you take them anywhere with the handy clip on the cap that attaches to pockets and notebooks. Bullet tip writes bold notes so you can see them clearly. Nontoxic markers are also low-odor for a more comfortable user experience. Cardboard display contains 12 sets of markers that are sealed in families of five onto a sturdy card with a hanging slot.